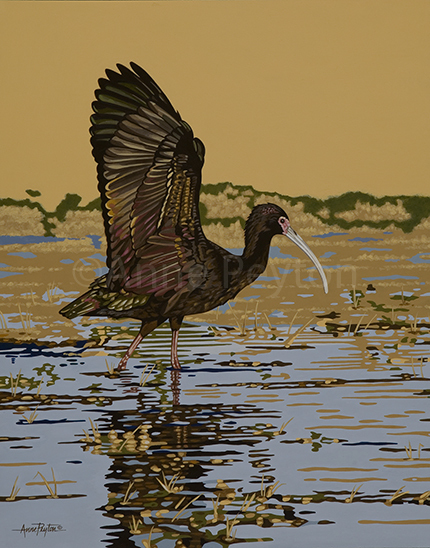 (October 3, 2018) - “Rushing Water” (Snowy Egret) and “Sun Salutation” (White-faced Ibis) are heading to the 2018 Kentucky National Wildlife Art Exhibit at the Preston Arts Center in Henderson, Kentucky. The exhibit runs October 3 through November 29. UPDATE: “Rushing Water” received the David and Arlene Alexander Award at the Kentucky National Wildlife Art Exhibit awards dinner on October 20. Special "thank yous" go to exhibit juror Kathy Kelsey Foley, Jule McClellan, and the Alexander Family, sponsors of this award. 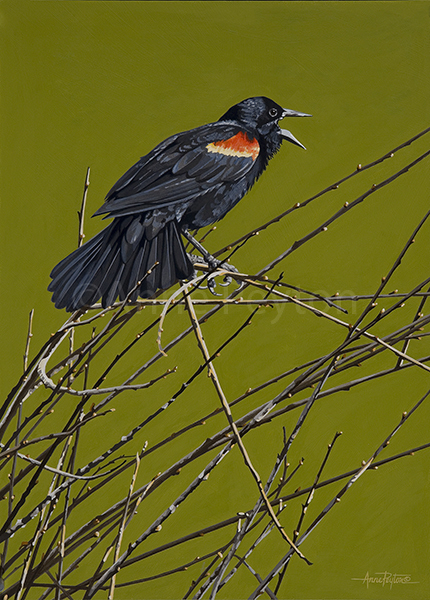 (July 27, 2018) - Anne Peyton’s original portrait of a Red-winged Blackbird, “On His Territory,” has been selected for the Society of Animal Artists’ 58th “Art and the Animal” annual exhibition. “Every morning, the marshes along the Salt and Gila rivers are alive with the songs of blackbirds and it can be so noisy that you cannot talk with others by your side,” Peyton said. “If you wait just a little longer, you can witness the blast-off, when thousands of blackbirds take off together for the nearby fields and dairy farms. Art and the Animal opens July 28 at the new James Museum of Western and Wildlife Art in St. Petersburg, Florida, and runs through October 23. Update: “On His Territory” was chosen for the Art and the Animal National Tour. The exhibition will visit The Hiram Blauvelt Art Museum in Oradell, New Jersey, November 17 through March 15, 2019, and continues at The Sternberg Museum of Natural History at Fort Hays State University in Hays, Kansas, April 6, 2019, through August 25, 2019. 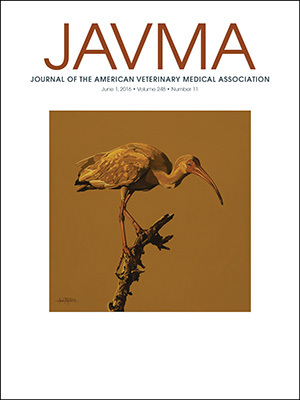 (May 22, 2016) - In March, Anne Peyton’s “Gulf Coast Gold” received the Journal of the American Veterinary Medicine Association Award at the Animals in Art International Exhibition at the LSU School of Veterinary Medicine in Baton Rouge, Louisiana. “Being on the cover of this prestigious journal is one of the highlights of my professional career,” Anne said. “So many veterinarians that I know through my work with Liberty Wildlife have positive comments about the cover art. 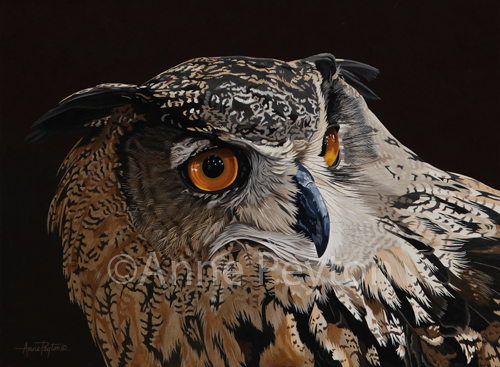 (March 29, 2015) - “Bird’s Eye View,” Anne Peyton’s original painting of a Eurasian Eagle Owl, was selected for the 4th Artists For Conservation Festival. The painting was also selected for the cover of the AFC’s annual exhibit book. “Seeing a Eurasian Eagle Owl for the first time left me awestruck,” Peyton said. “They are among the largest of all owls in the world but what captured my attention were those large, pumpkin-colored eyes. The exhibit opened at the Grouse Mountain Resort’s Spirit Gallery in North Vancouver, B.C., Canada, in September 2014 and features artist displays, lectures and films during the stay. Forty-five pieces, including “Bird’s Eye View,” were selected for the tour which opened at the Arizona Sonora Desert Museum in Tucson, Ariz., in January 2015. The exhibit travels to south Florida where it will appear in two venues: the Ansin Family Gallery at the Miramar Cultural Center in Miramar, Fla., from April 25 through May 3; and Nova Southeastern University’s Alvin Sherman Library in Fort Lauderdale, Fla., between May 12 and June 15. 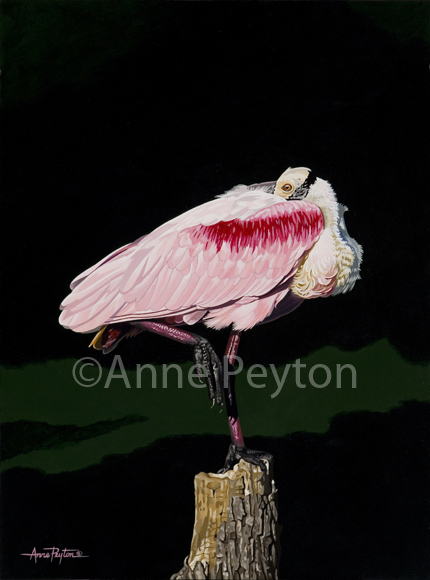 (November 7, 2014) - Arizona wildlife artist Anne Peyton is featured in the November 2014 issue of American Art Collector. The two-page spread, “A World of Birds,” is one of Anne’s awards for second prize in International Artist magazine’s Challenge No. 83: Wildlife. In the article, Peyton discusses her methods for creating her award-winning paintings and the research process to ensure that each piece is accurate both artistically and scientifically. “All the birds that I paint are subjects that my husband and I go out and find, so they’re all birds in their natural settings, and I like the detail of things, so the anatomy is an important part of everything to me,” Peyton says.